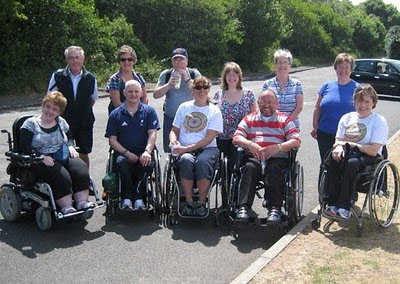 Bob Cowan reports that members of the Braehead WCC held a sponsored 10 mile wheelchair push to raise funds for Erskine Hospital. Michael McCreadie said, "For the past five years we have raised money for our own club. However, this year we felt it appropriate that another worthwhile organisation should benefit." 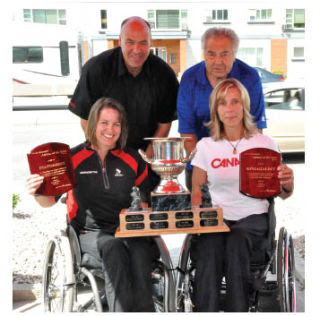 The Richmond Centre for Disability has been very active in its support for wheelchair curling over many years. This year they are celebrating their 25th Anniversary and are planning the 2010 International Bonspiel to be the biggest yet. The competition runs from December 1 - 4, with practice ice available November 30th. Entries are $250 for up to 12 teams with half payable by the registration deadline of September 30. They are currently negotiating hotel accommodation, and would appreciate an expression of interest in attending ASAP. 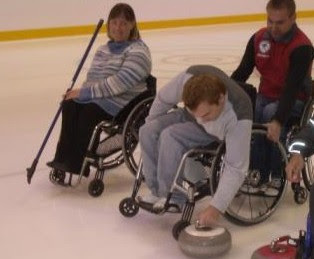 The Ontario Curling Association has polled their competitive wheelchair curlers and coaches on their views on their preferred method of Team Canada formation. The poll asked for four selection methods to be ranked, and promised that the results would be tabulated and shared with the other provinces at the CCA's Annual General Meeting next week. We now know that this issue is being raised by at least two provinces. Option 1: Continue the current selection process as run by the CCA with their National Coaching staff selecting the 5 members of Team Canada from any province. Option 2: Have the winner of the Canadian Wheelchair Championship represent Canada at the World Championship in the same season that the World Championship is held. Note: this option requires changes in scheduling of Provincial and National Championships. Option 3: Have the winner of the Canadian Wheelchair Championship represent Canada at the following year’s World Championship. Note: this option allows the winning Canadian Championship team to receive additional coaching/training and competition for up to one year before competing at the World Championship. Option 4: Have the winner of the Canadian Wheelchair Championship play a best 3 of 5 games playoff against the “selected” Team Canada for the right to represent Canada at the World championships. If you haven't already done so, you might want to browse the opinions expressed in the thread "Team Canada - time for a change?" to familiarise yourself with some of the issues. Then please add a comment and your ranking, with any explanation for your choices, to the comments below.